Our most professional system, Pro-Stage is a modular, height adjustable, telescoping leg staging system constructed of strong, yet light weight aluminum platforms and telescoping legs. Manufactured out of the finest high grade raw materials and to the highest quality specifications, Pro-Stage is proud to have earned the International TUV certificate of quality which ensures maximum quality and safety. Pro-Flex staging is available in a strong, Black Industrial surface finish. Stage panels easily connect together form a custom stage sizes to fit your needs. A key design feature that sets Pro-Stage apart is it's unique interchangeable, height-adjustable, telescopic legs. These legs make it possible to smoothly and precisely adjust the stage height to several different height ranges from as low as 16" to as high as 78" One of the highest ranges in the industry! These unique telescoping legs also allow your stage to be installed on different terrains such as slopes, hills and sidewalk curbs. A full range of accessories such as storage trolleys, guardrails, skirts and steps are also available. These stages come with a standard 10 year warranty. 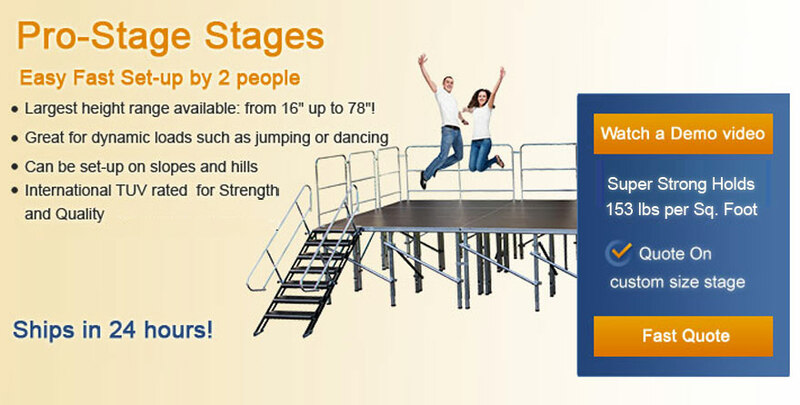 Pro-Grade staging great for dynamic loads such as dancing or jumping. Modular, height-adjustable, telescoping leg staging system based on aluminium construction. Can be installed on flat as well as on uneven surfaces such as slopes, curbs, and hills. Available in metric and imperial sizes; 4ft x 8ft platforms. Available with various heights of adjustable legs which can be set at heights ranging from 16” up to 78” (40cm to 200cm) high. Universal leg corners allow you to use square or round cut pipe legs on the same platform. Perfect for production companies! This system is designed for various events and concert markets. Stairs, guardrails, and transportation trolleys are available. Weight capacity:153 lbs per sq. foot (750 KGS/sq. Meter).